Colorado Springs campus leaders and partners mark 100 years of Webster University. 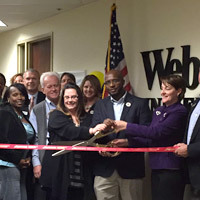 The Colorado Springs metro campus location recent celebrated Webster University’s centennial with a ribbon-cutting event marking the University's 100 years. Webster Colorado Springs alumni champion Jerome Ford, campus director Margaret Reed, and Regional Business Alliance chair John Wilson each spoke briefly about Webster University and its contribution to Colorado Springs, and how the University prepares students for the next century. The event also gave the Colorado Springs campus another opportunity to showcase for community leaders and citizens Webster's stellar programs, great customer service and success as a nonprofit education leader. To honor 100 years of changing lives and building strong communities, Webster University is recognizing its Centennial anniversary with a year-long celebration from September 2014 through November 2015. The year of celebration includes festivities and centennial-oriented events involving all Webster campus locations.